I was very impressed with the wonderful location of the court tomb at Ally in County Tyrone. 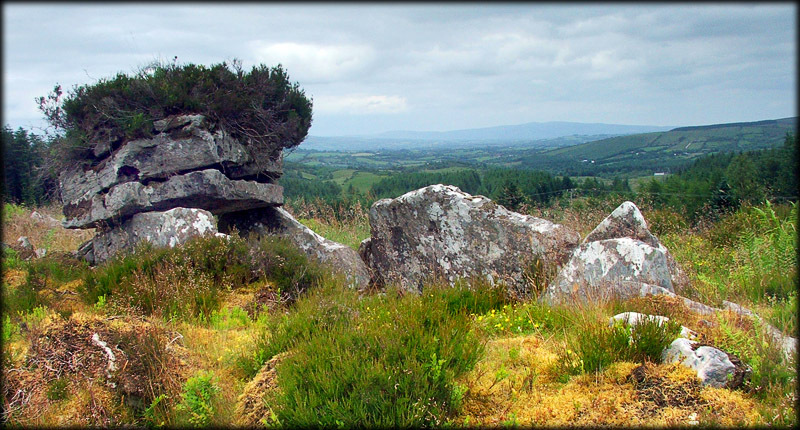 Situated about 50 metres from the Drumskinny to Drumquin road, the tomb sits in a clearing in Lough Braden Forest and is very accessible to most visitors. The image shown right was taken from the back of the long gallery looking north towards the court. The only remaining part of the roof is the lintel stone which has split in two. It is hard to say how many chambers existed, but towards the back of the cairn there is a subsidiary chamber with an eastern entrance. It is impossible to make out the forecourt as it been converted into a modern sheepfold. Situated: From Enniskillen take the A32 North to Kesh then the B64 to Ederny. From here head North for Blacktown, after about 5 kilometres take a right turn sign posted Drumquin, look for the waterworks on your right. Immediately after the waterworks there is a slight layby on your left, pull in here and take the small track up the hill, the tomb is on your right next to the track. Discoverer Map 12: H 2577 7247. Last visit June 2005.